If you’re wondering whether or not your home or yard is at risk, you should know that most properties can attract these silent destroyers because they survive on wood. That’s the bad news. The good news is, we’re experts in preventive care. Don’t have a termite problem? We’ll keep it that way. If you do, we’ll make sure it goes away fast. We combat termites by using the best product in the industry: Bayer. This powerful solution is undetectable to termites, making it impossible for them to avoid. 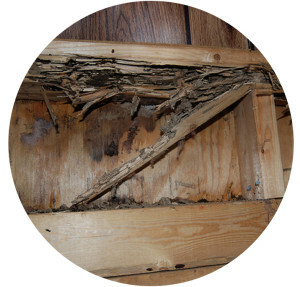 Once termites are exposed, they unknowingly spread it to others and effectively wipe out the entire colony. Our expert team of pest pros develop unique strategies to guarantee that your residence will stay termite free. Instead of using inferior baiting methods recommended by many pest companies, we utilize Bayer liquid treatment. Rather than relying on attracting termites to poison a colony, Bayer creates an invisible barrier that protects your entire property. We promise to protect your home from termite damage or we’ll offer a full refund* of your contract and retreat* your property for free. No other pest prevention company in Uttar Pradesh stands by their service like we do. Bayer, World’s #1 termite defense solution, even backs up our guarantee*. *Available to qualifying homes. All guarantees are transferrable to future residents.